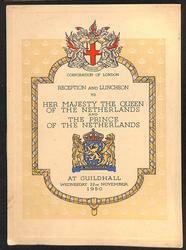 RECEPTION BY THE CORPORATION OF THE CITY OF LONDON OF THEIR MAJESTIES THE KING & QUEEN OF THE BELGIANS. 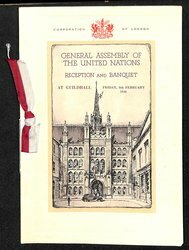 list of wines, a dinner menu, a programme of toasts and music, a list of the committee members. 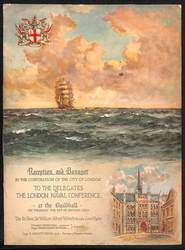 LONDON CHAMBER OF COMMERCE ANNUAL DINNER TUESDAY JULY 26, 1921, CHAIRMAN, MR. STANLEY MACHIN, J.P. (PRESIDENT OF THE CHAMBER) featuring the GUEST OF HONOUR, H.R.H. 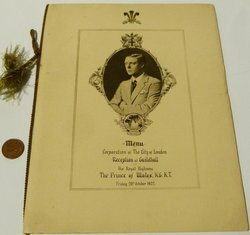 THE PRINCE OF WALES K.G. 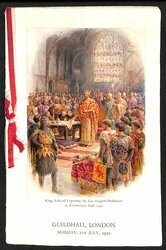 RECEPTION AT GUILDHALL OF HIS ROYAL HIGHNESS THE PRINCE OF WALES, K.G.K.T FRIDAY 20TH OCTOBER 1922. 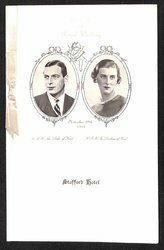 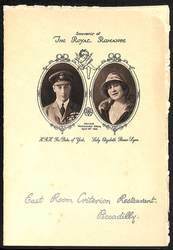 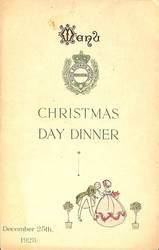 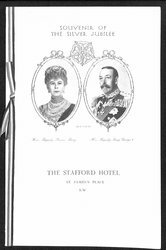 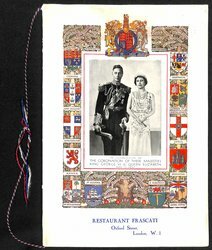 Edward VIII but he never became king as he abdicated, contains a list of wines, a dinner menu, a programme of toasts and music, a list of the reception committee and a list of commoners. 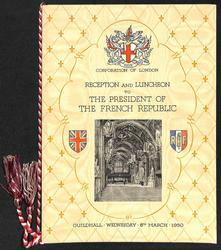 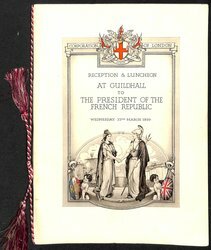 RECEPTION BY THE CORPORATION OF THE CITY OF LONDON AT GUILDHALL OF THE PRESIDENT OF THE FRENCH REPUBLIC M. GASTON DOUMERCUE. 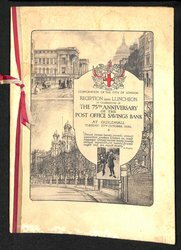 18TH MAY, 1927. 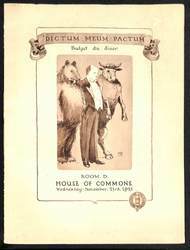 BUDGET DU DINER ROOM D HOUSE OF COMMONS, WEDNESDAY NOVEMBER 23RD, 1927.
cover has a sepia image of a bear, Stanley Baldwin, and a bull standing arm in arm under a banner reading 'DICTUM. 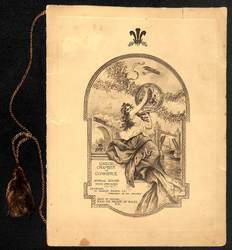 MEUM. 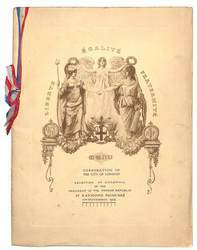 PACTUM". 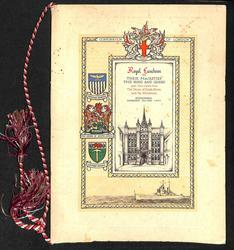 Dictum Meum Pactum translates as Said my Covenant or (My Word is my bond). 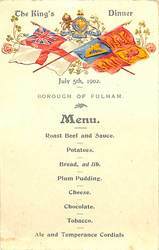 The bull stands for John Bull England and the Bear Russia. 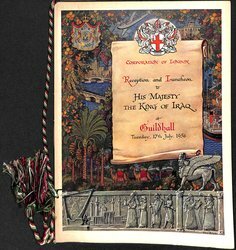 Stanley Baldwin was Prime Minister & Leader of the House of Commons for three terms 1923-24-;; 1924-29 ;;; & 1933-1937.-- Thanks to Don Richards for help with the symbolism. 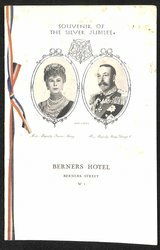 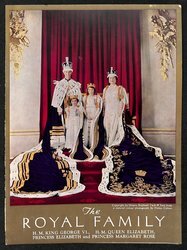 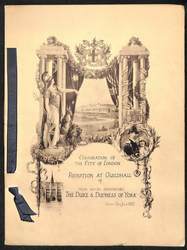 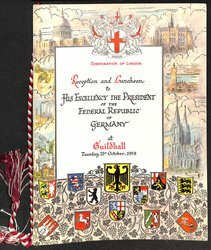 RECEPTION AND BANQUET BY THE CORPORATION OF THE CITY OF LONDON TO THE DELEGATES TO THE LONDON NAVAL CONFERENCE AT THE GUILDHALL ON THURSDAY THE 23RD OF JANUARY, 1930.
imprinted in back cover RAPHAEL TUCK & SONS LTD.
ROYAL LUNCHEON TO THEIR MAJESTIES THE KING AND QUEEN UPON THEIR RETURN FROM THE UNION OF SOUTH AFRICA AND THE RHODESIAS. 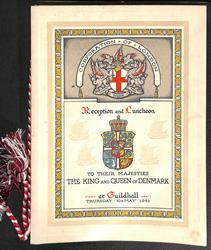 GUILDHALL THURSDAY 15TH MAY 1947, front cover has an image of the guildhall above a battleship plus heraldic crests from the CORPORATION OF LONDON, NORTHERN RHODESIA, THE UNION OF SOUTH AFRICA AND SOUTHERN RHODESIA, decorative red and white cord, eight internal pages, includes personal invitation and presentation card, back cover imprinted RAPHAEL TUCK & SONS LTD. 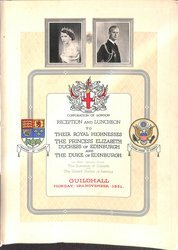 CORPORATION OF LONDON RECEPTION AND LUNCHEON TO THEIR ROYAL HIGHNESSES THE PRINCESS ELIZABETH DUCHESS OF EDINBURGH AND THE DUKE OF EDINBURGH ON THEIR RETURN FROM THE DOMINION OF CANADA AND THE UNITED STATES OF AMERICA GUILDHALL MONDAY 19TH NOVEMBER 1951, cover with portraits, heraldic crests, and decorative red and white cord, eight internal pages plus a personal pass ticket, on back cover RAPHAEL TUCK & SONS LTD. FINE ART PUBLISHERS TO THEIR MAJESTIES THE KING AND QUEEN AND TO HER MAJESTY QUEEN MARY, LONDON AND NORTHAMPTON CHICAGO TORONTO MADE IN ENGLAND COPYRIGHT. 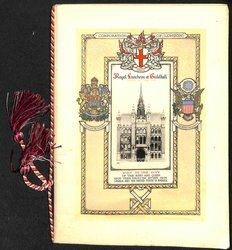 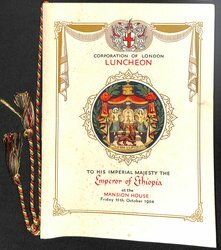 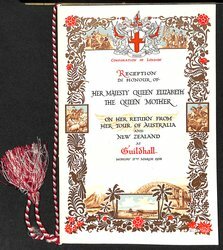 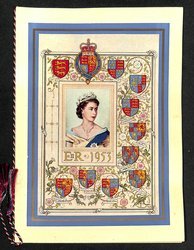 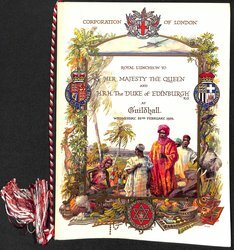 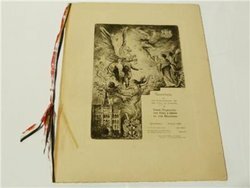 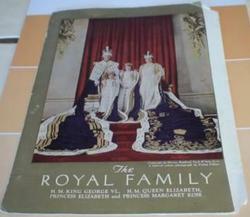 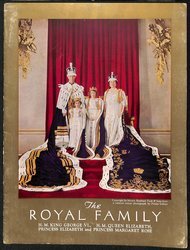 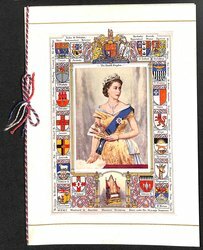 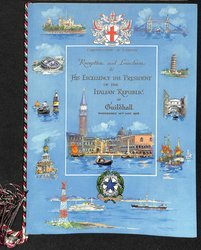 CORPORATION OF LONDON LUNCHEON TO HIS IMPERIAL MAJESTY THE EMPEROR OF ETHIOPIA AT THE MANSION HOUSE FRIDAY 15TH OCTOBER 1954, elaborate cover image with decorative red, yellow, and green cord, eight internal pages. 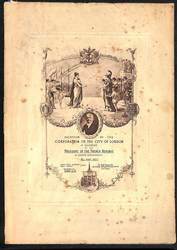 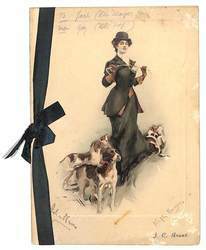 on back cover RAPHAEL TUCK & SONS LTD. 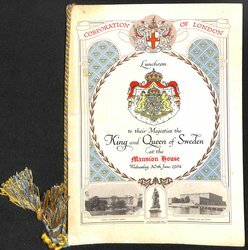 CORPORATION OF LONDON LUNCHEON TO THEIR MAJESTIES THE KING AND QUEEN OF SWEDEN AT THE MANSION HOUSE WEDNESDAY, 30TH JUNE, 1954, cover images of BUCKINGHAM PALACE, QUEEN VICTORIA STATUE, THE ROYAL PALACE STOCKHOLM, plus heraldic crests and blue and yellow decorative cord,eight internal pages, on back cover RAPHAEL TUCK & SONS LTD. 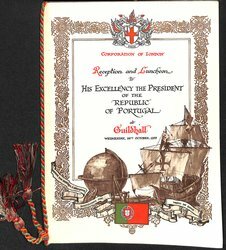 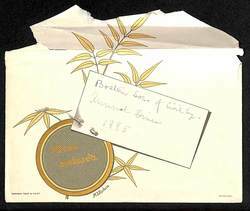 CORPORATION OF LONDON RECEPTION AND LUNCHEON TO HIS EXCELLENCY THE PRESIDENT OF THE REPUBLIC OF PORTUGAL AT GUILDHALL WEDNESDAY 26TH OCTOBER, 1955, cover image of a globe and a sailing ship, orange and green decorative cord, eight internal pages, on back cover RAPHAEL TUCK & SONS LTD. 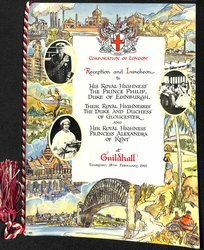 CORPORATION OF LONDON RECEPTION AND LUNCHEON TO HIS MAJESTY THE KING OF IRAQ AT GUILDHALL TUESDAY 17TH JULY 1956, elaborate cover image with decorative black, white, red and green cord, eight internal pages, on back cover RAPHAEL TUCK & SONS LTD. 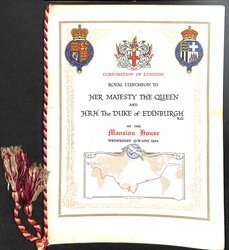 CORPORATION OF LONDON RECEPTION AND LUNCHEON TO HIS ROYAL HIGHNESS THE DUKE OF EDINBURGH, K.G. 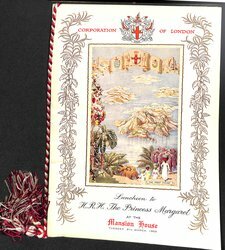 AT THE MANSION HOUSE TUESDAY 26TH FEBRUARY 1957 following his world tour, cover image of two globes and a ship embossed in gold, decorative red and white cord, comes with a clear protective sleeve THIS ENVELOPE IS PROVIDED TO CONTAIN THE SOUVENIR MENU CARD, and a TABLE PLAN , eight internal pages, on back cover RAPHAEL TUCK & SONS LTD. 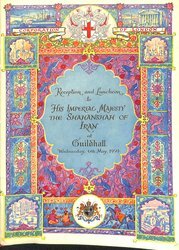 CORPORATION OF LONDON RECEPTION AND LUNCHEON TO HIS IMPERIAL MAJESTY THE SHAHANSHAH OF IRAN AT GUILDHALL WEDNESDAY 6TH MAY 1959, elaborate cover design with explanation of details given on the inside back cover, gold embossing, decorative white, red and green cord, four internal pages, copy of the CEREMONIAL agenda, on back cover RAPHAEL TUCK & SONS LTD. 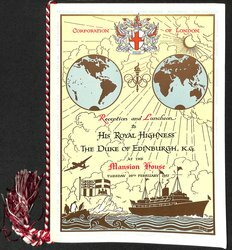 CORPORATION OF LONDON RECEPTION AND LUNCHEON TO HIS ROYAL HIGHNESS THE PRINCE PHILIP, DUKE OF EDINBURGH, THEIR ROYAL HIGHNESSES THE DUKE AND DUCHESS OF GLOUCESTER AND HER ROYAL HIGHNESS PRINCESS ALEXANDRA OF KENT AT GUILDHALL THURSDAY 18TH FEBRUARY 1960, cover design of vignettes from some of the countries visited during the world tour plus royal portraits, explanation of images is given on the inside back cover, decorative red and white cord, eight internal pages, on back cover RAPHAEL TUCK & SONS LTD. 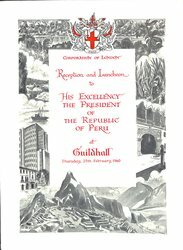 CORPORATION OF LONDON RECEPTION AND LUNCHEON TO HIS EXCELLENCY THE PRESIDENT OF THE REPUBLIC OF PERU AT GUILDHALL THURSDAY 25TH FEBRUARY 1960, cover images represent the three periods in the history of Peru as taken from the explanation given inside back cover, eight internal pages, on back cover RAPHAEL TUCK & SONS LTD.